In the winter months, I really look forward to some big beers. So what do I mean by “big beers”? The imperial stouts that are made with tons of grain to achieve a high gravity and ABV. There is something so decadent about these beers. The rich malt flavor and smooth mouthfeel makes my night when I come out of the cold after a long day. White Elm Brewing excels at creating these wonderful stouts. I remember my first one I had at a local restaurant. I had finished the meal and was looking for something to cap off the evening. I saw an imperial stout from White Elm Brewing out of Lincoln, Nebraska and had to give it a try. It was very remarkable and from that point on, I make sure to try as many as I can. I happened to be in the taproom on the day Continuous Chaos was released. i was intrigued by the fact that this beer was a coffee imperial stout. Always love a good coffee stout. The other part was maple flavor added. So I saved this one for a couple of weeks and my anticipation was building on what it would be like. The maple flavor hits you at the beginning of this beer. Nice and sweet up front! The mouthfeel is smooth and silky. The back end is where I get the coffee flavor. The coffee in this stout is Cultiva Black Label Toddy. I highly recommend trying out this imperial stout, if you get the chance. I have been holding onto this one for just the right moment. Long day at work and time to sit down to enjoy a coffee stout! Nice dark stout with a perfect foamy head. Raising the glass up to my nose, I get an equal amount of coffee and roasted malt aroma. From the first taste, I take in lots of the roasted flavor. This is definitely a nice, rugged stout. My palate is not picking up much on the chocolate malt in this stout. The coffee flavor is nice, but I wish it was just a little bit more bolder. This is definitely one that you can enjoy sipping over a nice long conversation. In terms of the Holy Grail Scale, I will give this one a 6. Great stout flavor! Cheers! I can't imagine what the breweries go through when it comes to selecting the right blend of coffee for their stouts. Bell's Brewery has hit this one out of the park! The aroma of this beer has a nice enticing coffee aroma. Not overpowering but lets you know what you are about to drink. As I take a sip of this milk stout, I get a different combination that I have not had before. It is creamy on the front end, coffee in the middle, and creamy again in the back end. The coffee flavor afterwords does linger and for a coffee lover like myself, I enjoy that! I can see how this beer got its name. I know it doesn't take long after I open one for it to disappear! On the Holy Grail Scale of Coffee Stouts ... I give it a 10. The combination of the bold, rich, coffee flavor with the milk stout creamy finish makes this an amazing coffee stout! I have been waiting for almost a month for this coffee stout to come out. When I heard about it, I couldn't wait to try it. From the picture you can see the beautiful, creamy head on this wonderful colored stout. As you raise the glass, the coffee aroma fills your nose. The front end has amazing bold coffee flavor. 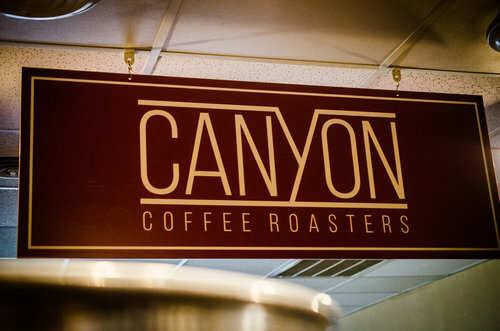 The coffee comes from the Canyon Coffee Roasters in Lincoln. I won't give away the blend of coffee in this - I will let you try it first! The back end has a very smooth creamy taste. You would think you are drinking a milk stout, but it isn't. The creaminess comes from the malts used in this beer. For coffee lovers this is one that you must try! For more information on Lazy Horse click on the name. Oh you thought I forgot to rank this on the Holy Grail Scale of Coffee Stouts ... It is definitely a 10. The combination of the bold, rich, coffee flavor with the creamy finish is a winner in my book! My first Coffee Stout from an Oregon Brewery and this one is solid! Nice coffee aroma in a smooth front end stout and the back end has a little hop edge. I didn't notice the vanilla flavor too much in this brew. The kona coffee flavor is good but I prefer just a little bit bolder flavor. On the Holy Grail Scale, I will give this one a 7. Cheers! It has been awhile for a having a Coffee Stout and let me tell you this one is very enjoyable! Aroma is earthy and roasty. As you swish the beer in your mouth, it is super silky. The coffee is bold but not bitter. You can tell a lot work goes into the coffee portion of this brew. There is only a minor hint of chocolate. On the Holy Grail Scale - I give this one my very first 10! Oh my this is one flavorful Imperial Coffee Stout! This beauty is aged for 6 months in a Mt Gay Anjeo Rum Barrel. The flavor from this rum barrel is incredible. The aroma from the rum and Cultiva Toddy coffee draws you in immediately. The first sip hits your taste buds with rum, cocoa, and a nice hint of coconut. Believe me this beer doesn't taste like a 12.1% ABV beer. I love all of the flavors wrapped into the 10 oz pour that I had. For me though, a little bit more coffee flavor would add to this wonderful stout. I have this coffee stout at a 9 on the Holy Grail Scale. If you are in Lincoln, NE check out White Elm Brewing at 2717 S 8th St, they have a great selection of quality craft beers! Looking for some great coffee, then make sure to check out Cultiva Espresso & Crepes in Lincoln at 727 S 11th St.
Wasn't expecting to find another incredible coffee stout from a Nebraska brewery, but Calico Espresso Stout by Thunderhead Brewing Company is a coffee lover's dream! This incredibly smooth stout from Kearney, Nebraska gets its great coffee flavor from the espresso provided by the Calico Coffee Company. The espresso and hint of chocolate flavor is pure happiness for your taste buds! I highly recommended that you give this one a try. On the Holy Grail Scale, I have the Calico Espresso Stout at a 9. It you make it out to Kearney, check out Kitt's Coffee Bar featuring Calico Coffee Co. in the morning and pull up a bar stool in the afternoon at the Thunderhead Brewing Company taproom. Other taproom locations include Omaha, NE. Wide Eye is an attention grabber from the first sip. This coffee stout has a bold coffee flavor delivered from one of Omaha's favorite coffee shops - Archetype Coffee. This stout has immense flavor and will be loved by those who truly love coffee. On the Holy Grail Scale, Wide Eye comes in a 7 for me. I first fell in love with this beer over a year ago. The coffee flavor with a smooth vanilla finish makes it such a easy drinking flavorful beer. For the craft beer friends that I have, I provided them the opportunity to try this beer last summer when I purchased a keg. It was the hit of the party. I don't have the Holy Grail scale up yet but this one is definitely towards the top of that scale.